This timely volume introduces gerioperative care, a new model of surgical care for the elderly designed to improve surgical outcomes and prevent complications through a focus on communication and relationship-centered care. It is the only book to specifically address the care of older adults undergoing surgery, providing practitioners with critical, practical, and theoretical information from the initial decision to have surgery through the first follow-up visit post-discharge. The text includes the anatomy and physiology of aging, preoperative care, intraoperative and post-anesthesia care, postoperative care, returning home, risk appraisal, education, prevention, early intervention, multidisciplinary team collaboration, and effective communication across all systems of care. 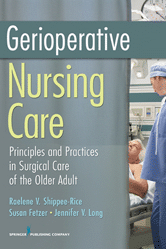 Gerioperative Care is an essential resource for students and practitioners of surgical, critical/acute care, and geriatric nursing, along with clinical and case managers. The tools presented help to sustain and enhance quality nursing care for older adults considering surgery, undergoing surgery, and during post-surgery visits. Includes case studies with discussion questions.